FREE Same Day Delivery Auckland wide. ALMOST ALL DELIVERY AREAS ARE FREE! << HANDY HINT: Click in the Select your Delivery box then type the letter your suburb starts with. Click on the suburb your flower delivery is going to and find out if there are any rural delivery charges. > Order by 10:15am for guaranteed Business delivery today. > Order by 2:15pm for same day flower delivery to a home address today. > Order by 9:30am for flower delivery Saturday. > No Sunday flower delivery service sorry. Yes - You can order flowers ahead for delivery another day. 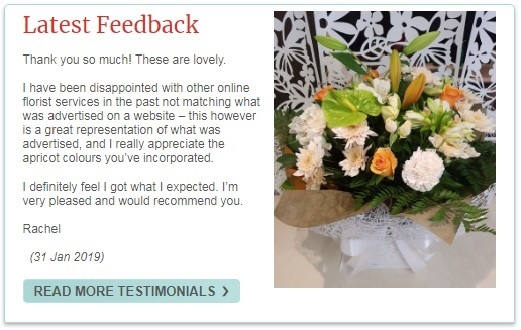 Our flower shop is located in West Auckland so we are able to deliver later than these times subject to courier availability. Please do call us to check on +64 9 838 9058.